While governments and the international media work to focus the world’s attention on the Islamic regime of Iran’s charm offensive on the nuclear front, the regime is rapidly escalating the rate of executions of Iranian people, many of whom are political prisoners. In service of their own interests, governments and the international media have chosen to ignore these murderous crimes of the regime. However, activists around the world refuse to remain silent and are raising their voices to condemn the ongoing executions in Iran. 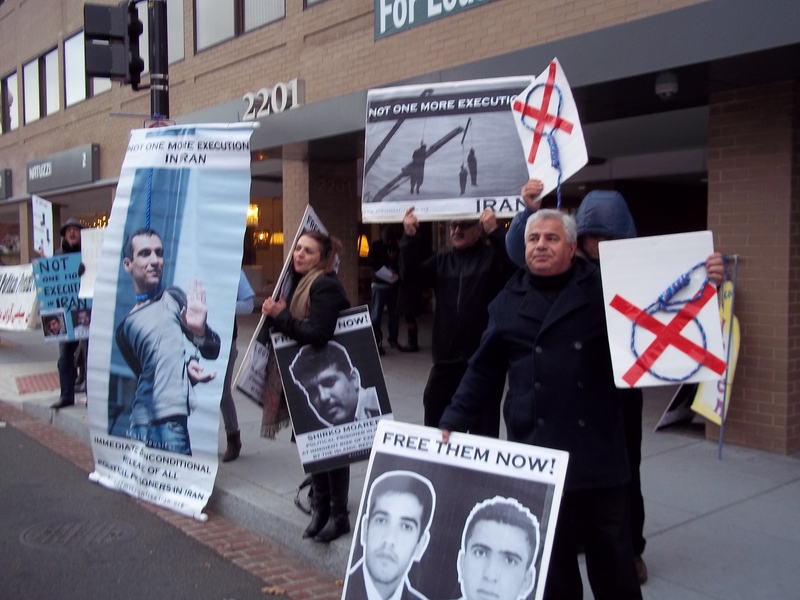 Activists from a number of organizations in Washington DC, including Mission Free Iran, Unity for Democracy and Justice in Iran, and Hambastegi, gathered at 3pm on Tuesday 12 November 2013 at the offices of the Islamic regime to condemn the wave of executions, to demand a halt to the killing, and to demand the immediate and unconditional release of all political prisoners.